This July I'm excited to be offering two workshops at the Del Ray Artisan Gallery for their GUAC or Grown Up Art Camp. The Gallery has offered art camps for kids for several years. But last year we decided that adults needed a little time for artistic fun as well. 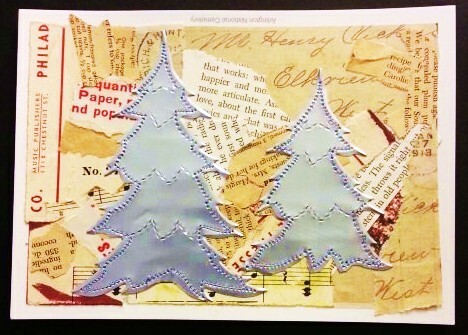 This year, I'm offering two workshops. 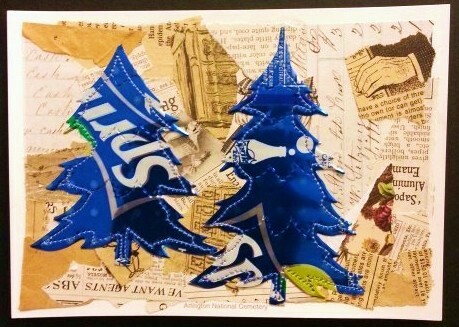 Both only 1/2 day and both involve the creative us of recycled aluminum soda cans. Come join me and let's have some fun.....let's be creative with recycling. Come join me and let's work together to save the planet; one soda can at a time!!! Want to make a fashion statement this summer? make them for all your friends. All supplies and some tools provided. Instructor (that's me) will have 100's of pre-cut cans. 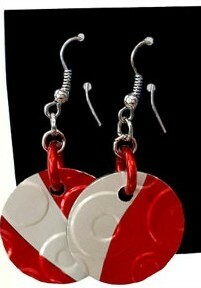 But if you want a specific color, flavor, or brand, bring 2 clean (un-cut) soda cans for each pair of earrings you want to make. Tools list is sent at registration. 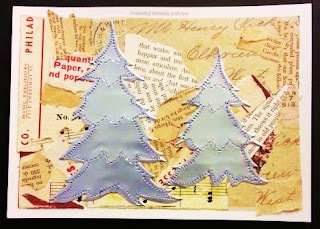 and learn a quick 3-step process to turn junk mail postcards into recycled seasonal fun. recycled aluminum soda cans will then be machine stitched over the collage. sewing machine, thread and needles. Complete supply list will be sent after registration.